High up, inside a dome above the main mihrab is the most exquisitely carved sculpture I have seen to date. And I find myself gasping in awe. Is this for real? I am not too sure what stuns me more. 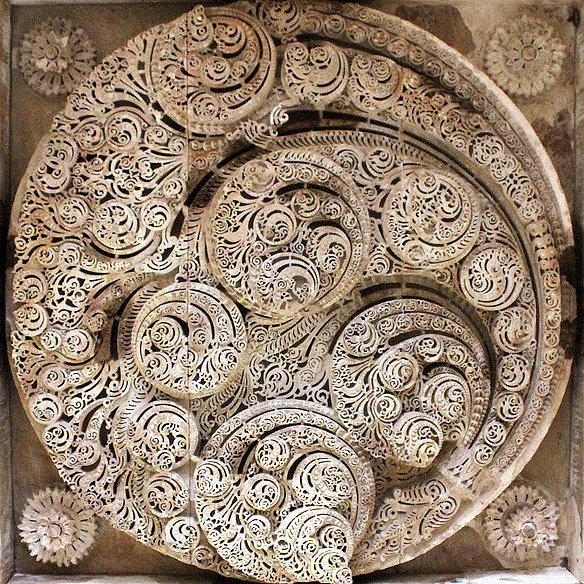 Its immense size, the fineness of the swirling leaves, or its incongruous placement—I am in a 500-year-old mosque in Champaner in Gujarat, 50-odd kilometres outside Vadodara, and the sculpture is Hindu-Jain in style and content. For those new to the eclectic mix of religion and spirituality which makes up India, Jainism, along with Hinduism and Buddhism, is one of the major religions which developed in ancient India. Built in 1484 by the Sultan of Gujarat, Mahmud Begada, and abandoned in 1535 with the advent of the Mughals, the medieval city of Champaner [Mahmud called it Muhammadabad] is one of India’s finest representations of this eclectic mix. A mix, however, created more by accident rather than any calculated design to propagate secularism. So how did this happen? Whilst the orders for the mosque’s construction came from a foreign Muslim ruler [the Gujarat Sultans were of Turkish descent], the masons, sculptors and artisans who gave shape to his architectural vision were indigenous Hindus and Jains. The latter, familiar only with their own art, used their personal artistic sensibilities to embellish the structures. The result is a unique style typical to Champaner, later imitated by the British Raj under the name “Indo-Saracenic.” Hence, we have domes and minarets decorated with swastikas and diyas. The deserted city is now, together with the nearby Pavagadh hill, a UNESCO World Heritage Site. Its prized centrepiece, Jami Mosque, once the main public mosque crumbles around me under the withering sun, suspended in time, whilst a couple of baboons shriek out at me for trespassing into their home. This entry was posted in Art and Me, Exploring India, Global Travel Shot, Gujarat and tagged Champaner, Gujarat Sultanate, Gujarat Tourism, Indo-Saracenic Style, Jami Mosque, Mahmud Begada, UNESCO World Heritage Site by Rama Arya. Bookmark the permalink. Breathtaking. And fascinating history. Thanks, as always, for sharing. Hello Shaun, what a lovely comment! The pleasure is mine. 🙂 Champaner is like a fairytale, a deserted forgotten fairytale replete with towering minarets and laced stonework which lived for just 51 years and was then buried under time. Lovely article. All religions can peacefully coexist if mankind would truly follow them. Jain angle to Indo-Saracenic is certainly a new thing! Yes, and that was my first reaction too. Manoj, my guide, the ex-sarpanch of Champaner village, and whose father, a professor, has carried out immense research on the site including authoring a book on the Champaner-Pavagadh archaeological site, explained it very easily. Oh my! What beauty…and your elegant use of language describes the scene with intricate detail. And thank you for taking the time to read my post and comment on it. 🙂 Appreciated. The artwork is just amazing… Would like to stop by sometime and admire this beauty. And I would like to show my work. As it is a photography blog. Champaner is a photographer’s delight. I hope you make it to the archaeological site some day. And yes, I visited your blog. Good luck with it. 🙂 PS. The picture of the mountain girl is lovely.